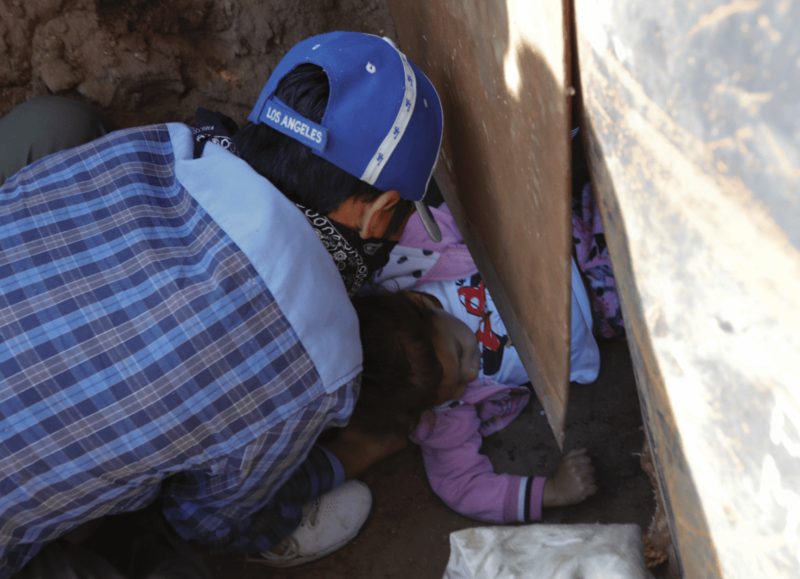 TIJUANA, Mexico – The woman crawled under first, squeezing face down through a gap dug under the border fence. The space is only a few inches high, and her feet kicked dust into the air as she wiggled. Next was her 3-year-old daughter, dressed in a pink sweat suit, pushed through to the California side on her back and feet first by a man who stayed in Mexico. U.S. Customs and Border Protection said Tuesday that the San Diego sector has experienced a “slight uptick” in families entering the U.S. illegally and turning themselves in to agents since the caravan of Central American migrants arrived in Tijuana two weeks ago. Rachel Rivera, 19, told The Associated Press that Honduras had become unlivable. Moments before flattening herself under the fence, she said she was slipping through to the U.S. in an attempt to “give a better life” to her daughter Charlot. It’s unclear where the families were taken from there. Standing nearby, Luis Fernando Vazquez, a migrant from Guatemala, said he won’t make a run for the border.